Here’s another interesting job I was privileged to work on in the town of Bicester, Oxfordshire. Bicester has a long, rich history – dating back to the Saxon age – but it is also one of the fastest growing in Oxfordshire. 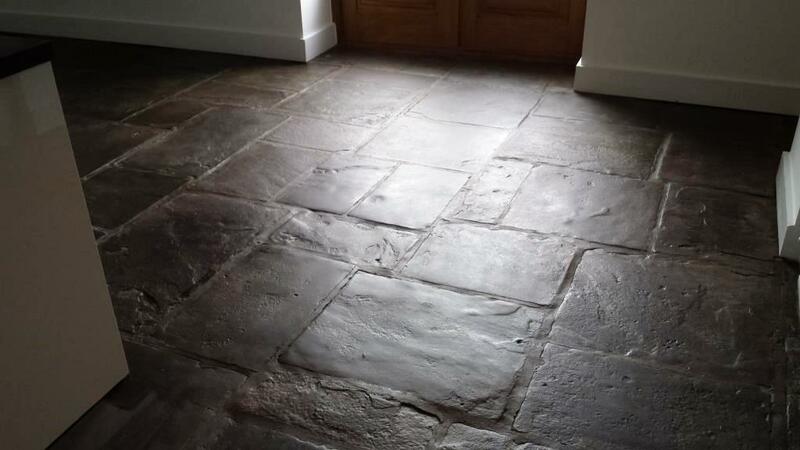 In fact, I had an opportunity to experience part of this history when I was called to a house to work on a old Flagstone floor which is believed to be 300-years old. 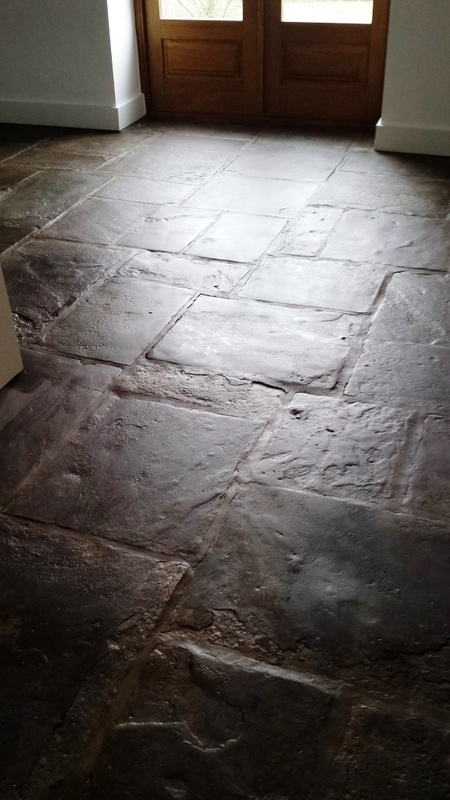 The use of flagstones for both interior and exterior flooring is believed to have been popularised in Europe around the 13th century AD, and flagstone is still commonly used for these purposes today. 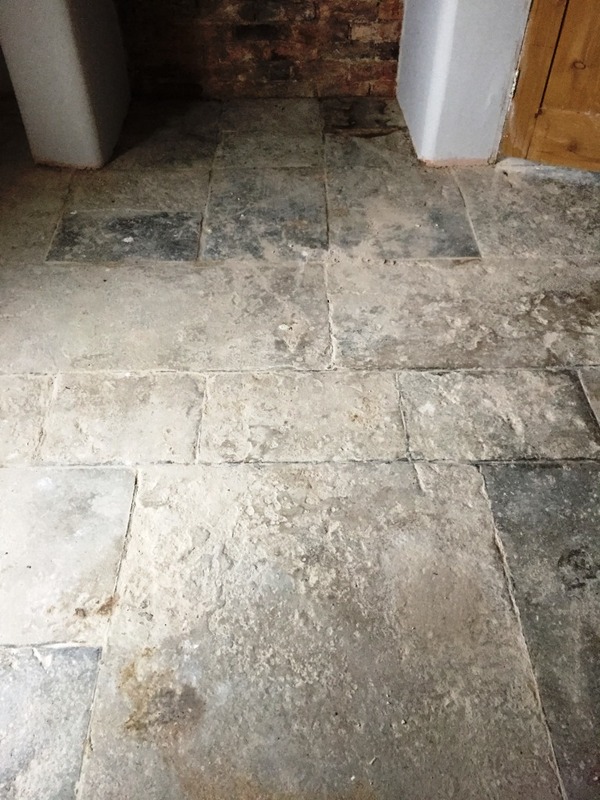 As one of the few surviving of its kind, this Old-Flagstone-floor- has a preservation order on it – this means that it can’t be covered by wood or other tiles. 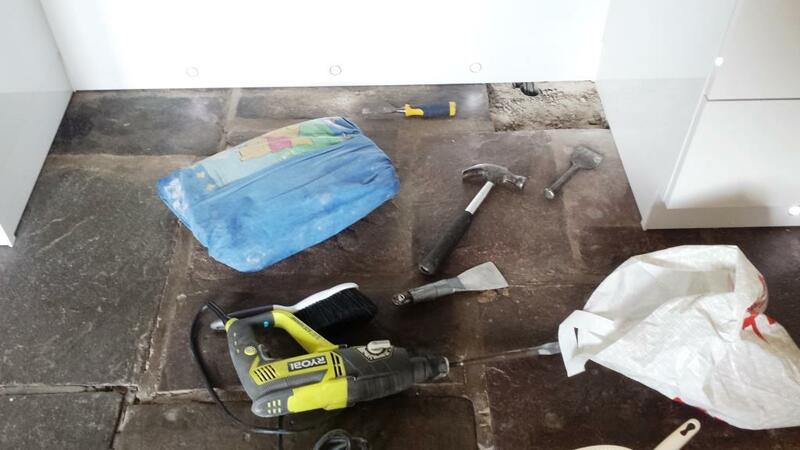 Unfortunately, the rooms in this building were previously used as a sort of ‘dumping ground’ for builders working on the property, covering the floor with cement, plaster, sealant and glue, while also inflicting significant surface damage. 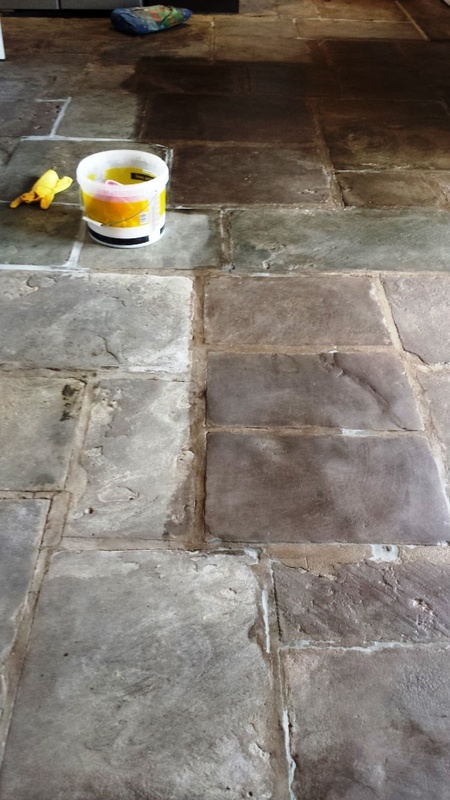 As a result, it would take me three days to restore the Flagstone tiles back to their best possible condition. 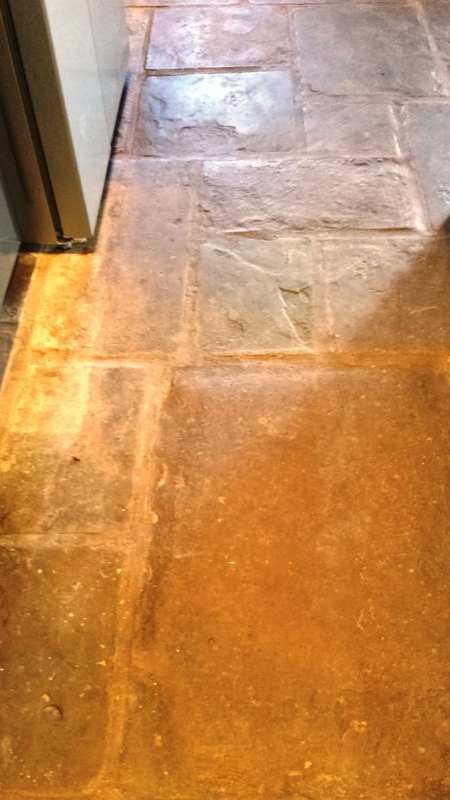 My first task was removing the medley of muck and dirt left over from the building works from the Flagstone tiles. I did this using a weak solution of Tile Doctor Pro-Clean and clean water (the concentration is adjusted according to the level of soil build-up). 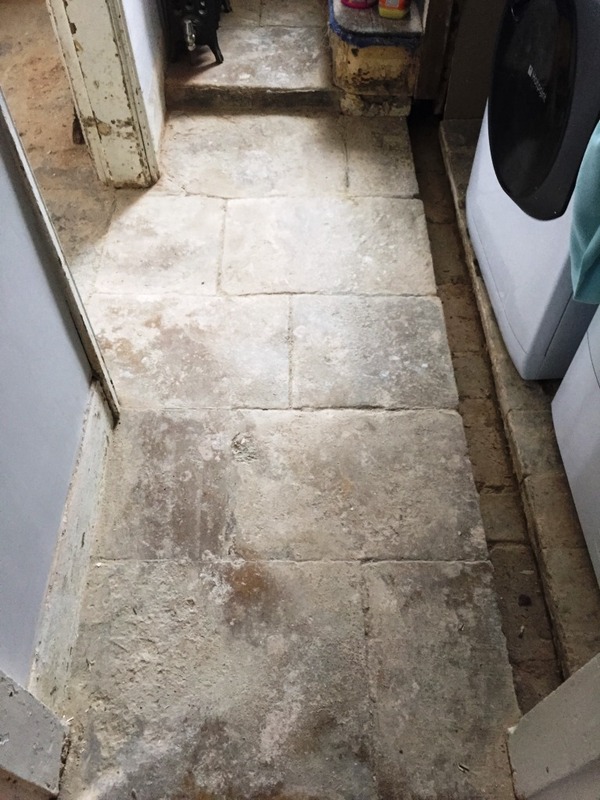 Pro Clean mixed with water is my go-to cleaning solution for most natural stone floors as it works well to lift out ingrained dirt and stains. I spread the solution evenly onto the floor and worked it into the stone using a scrubbing brush attached to a floor machine. I then rinsed off the excess cleaner, before sucking up the residue with a wet-vac machine. 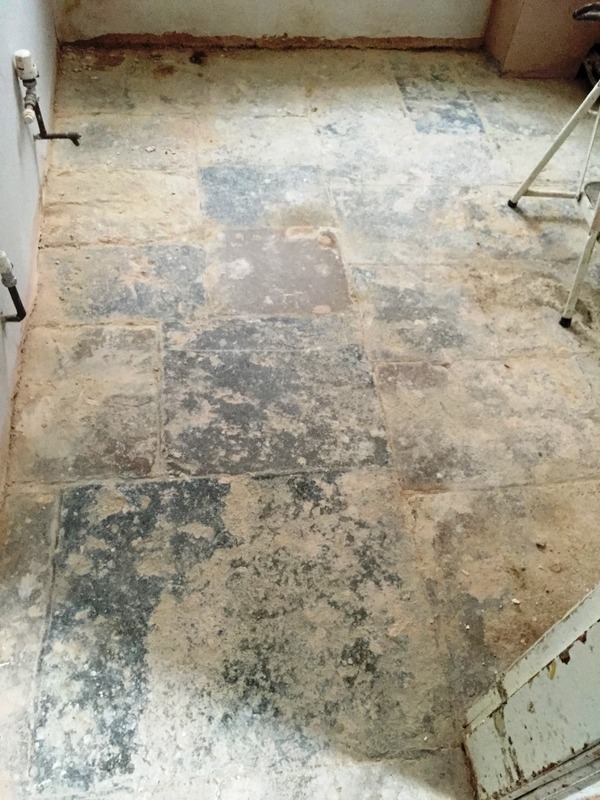 The second stage of the cleaning process was to strip the floor of any old sealers. 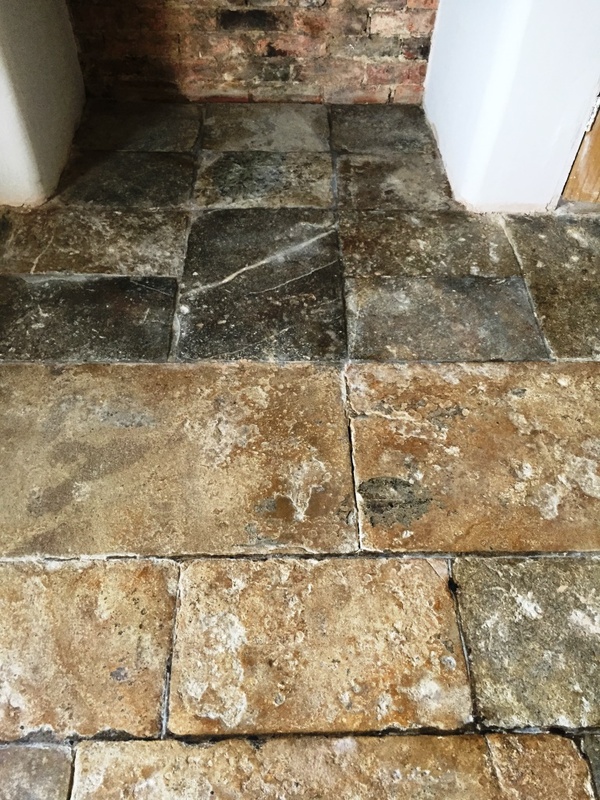 This was achieved, working in sections, using Tile Doctor Remove & Go, which can be used on unpolished natural stone floors, along with ceramic tiles, grout, and more. After leaving it to dwell for a short period, I scrubbed a layer of Remove & Go into the tiles using my floor machine and carbon brush. Following this, the floor was once again rinsed and any remaining moisture was removed with the wet-vac machine. After completing the cleaning, I moved on to the burnishing process. To give unpolished surfaces a nice polished look, the best method is to use a series of four diamond encrusted burnishing pads. This is exactly what I did, first using a coarse pad, before gradually moving up through medium and fine, to eventually using a very fine pad to achieve the desired polished effect. 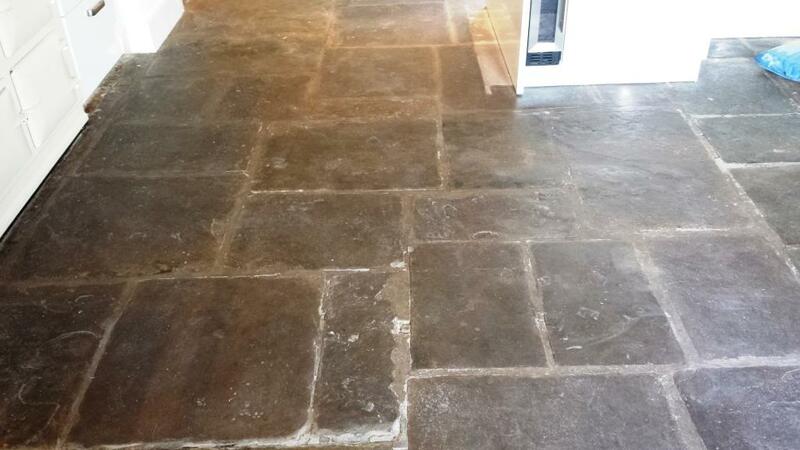 This is done without causing any further damage to the surface of the Flagstone tiles. On the final day, I completed the job by sealing the floor. I applied two coats of Tile Doctor Colour Grow, an impregnating sealer which works to provide durable surface protection from within. At the same time, Colour Grow is specially formulated to intensify the natural colours in a majority of different stones including Flagstone, Limestone, Marble, Quarry and Slate, bringing character and life back to otherwise dull surfaces. 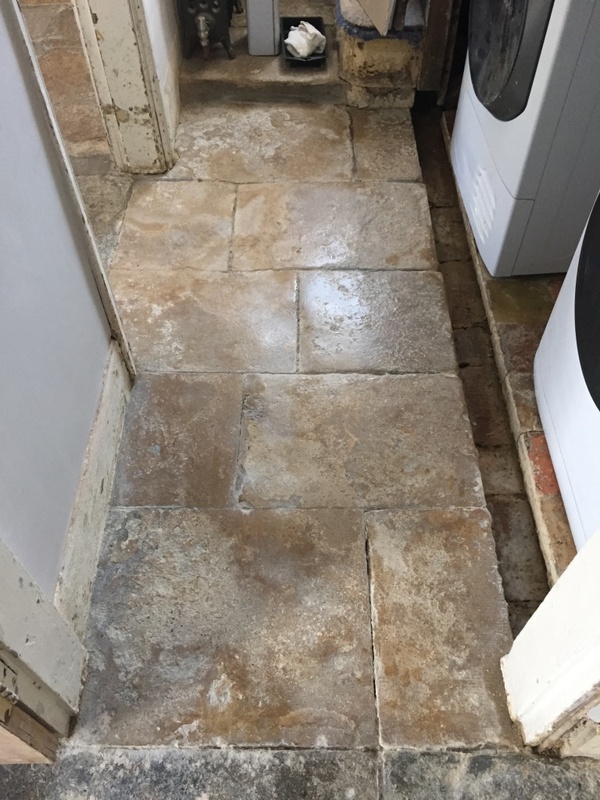 I’m pleased to say that the finished result exceeded my client’s expectations, especially considering the extent of surface damage and neglect the floor had suffered during construction work. It is highly rewarding to work on unique, historic floors like this and to contribute to its preservation for many more years to come. 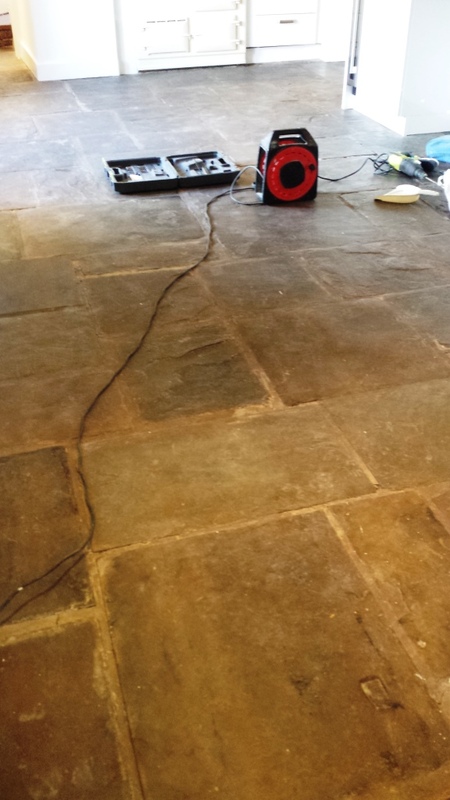 This flagstone floor was installed in a farmhouse in Caerleon near NewPort, it was actually the original floor dating back to 18th century and had been lifted up by the previous owners and re-laid with underfloor heating and a damp proof membrane, this was good news for me as so often with these old floors you can get damp issues rising up through the stone and consequently it can take a long time to dry out following a deep clean. I stripped the sealer off with Tile Doctor HBU (Heavy Build-Up Remover) Ultra-Clean mixed 50/50 mixed with Tile Doctor Pro-Clean to double the cleaning and stripping power and also to thin the HBU out. 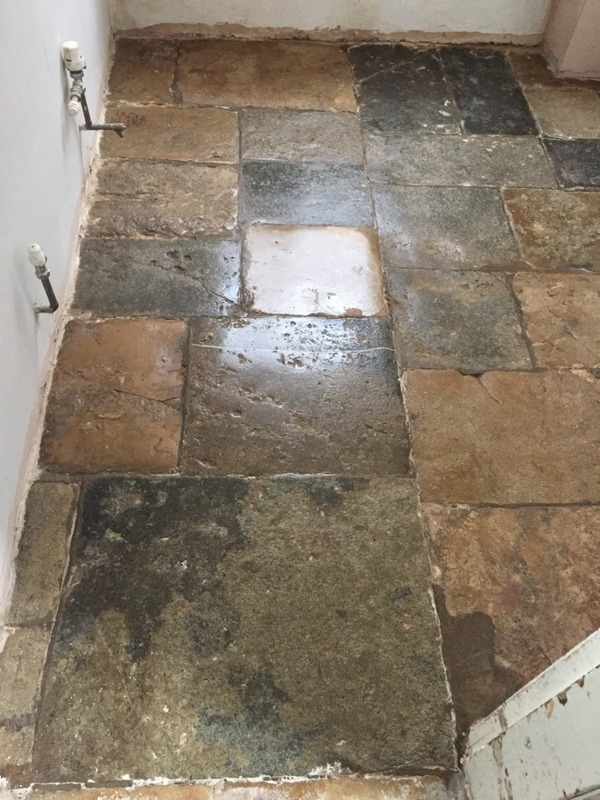 The old sealer had been applied two years prior when then the floor was re-laid as part of a renovation due to the farm house going on the market for the sale, it had worn through in the heavy traffic areas letting in dirt and now needed to be replaced. To work the cleaning solution into the floor I used a scrubbing machine with a stiff brush attached cleaning and rinsing as I renovated, the old sealer proved quite tough to shift in some areas so the process had to be repeated until I was satisfied all the old sealer and dirt had been removed. A lot of the cement joints had broken down which I repointed with fast setting Mapei floor grout colour matched to the original. One small piece of stone had to be replaced by the kitchen unit for which I managed to source a slab from B&Q after a hunt around from various outlets to match the original as best as possible. I left the floor to dry out for two days checking later with a damp meter to ensure it was completely dry before sealing. The customer wanted a satin finish as previously sealed so I applied three coats of Tile Doctor Seal & Go which gave the stone floor a nice mild shine and being water based didn’t leave smell whilst it dried.